Product prices and availability are accurate as of 2019-04-06 07:19:19 EDT and are subject to change. Any price and availability information displayed on http://www.amazon.com/ at the time of purchase will apply to the purchase of this product. 55 days. 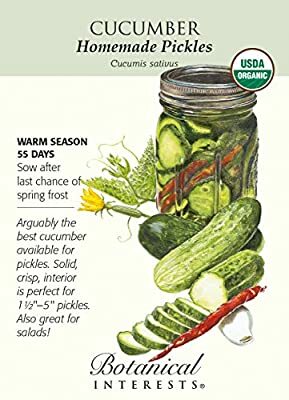 Making pickles at home is easy with Homemade Pickles. This plant has excellent disease resistance, very high yields, and is ready to harvest early. The 4 foot compact vines produce cucumbers for quite a long period; harvest anywhere from 1½" to 5" long. Perfect interior texture for pickles, but can also be eaten fresh. Excellent container variety.